Gerald Rudolph "Jerry" Ford, Jr. (Leslie Lynch King, Jr.; Julie 14, 1913 — December 26, 2006) wis the 38t Preses o the Unitit States. ↑ James M. Naughton, Adam Clymer (December 27, 2006). 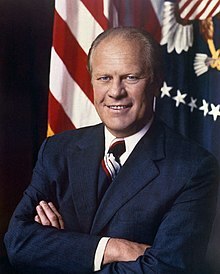 "Gerald Ford, 38th President, Dies at 93". The New York Times. Retrieved October 19, 2009. Wikimedia Commons haes media relatit tae Gerald Ford. This page wis last eeditit on 2 Mairch 2019, at 21:45.